This free online lesson is excerpted from the Digital Pile On chapter in Cyberslammed and only contains a portion of the lesson. Reference the book for the entire in-class curriculum. Students are introduced to the concept of a common tactic called a Digital Pile On, which uses group intimidation to single out and "gang up" on an individual in a digital environment such as chat rooms, online forums, Twitter or Facebook comments. Materials Needed: Download and distribute this "Digital Pile On" comic to everyone in the class. View here. Click to print out on a color printer. Best copied in color. How A Digital Pile On Happens: The Internet has its own culture and rules, something young people don’t always grasp as they navigate through this territory. A Digital Pile On reflects adolescent behavior that has always been around, whether it is offline or online. Students assume they are only communicating with their friends when, in fact, their messages are broadcast to a vast invisible audience. These are classic communication mistakes made by newbies. Compounding the problem is the fact that unsupervised online areas often breed incivility. A 2009 AP-MTV Digital Abuse Study found that nearly half of young people (45%) report that they see people being mean to each other on social networking sites. With a Digital Pile On, there is almost always a ringleader, someone with a grudge or a motivation. Dr. Rick Brinkman and Dr. Rick Kirchner, authors of Dealing With People You Can’t Stand: How to Bring Out the Best in People at Their Worst, have a term for this type of ringleader: a Sniper. With the anonymity and protection of closed Internet communities, and armed with a motive, the Sniper has the perfect opportunity to attack with rude comments, sarcastic humor, and biting commentary, much to the amusement of the followers. Often, bystanders who are lurking to witness the drama unfold turn into followers when they choose to join in and make an online comment that supports the bully's position. An ally (or upstander) is a person who chooses to defend or support the target. Most teachers will recognize the “ganging up” aspect in the accompanying comic, but online conflict isn’t always clear-cut. Once you’ve gotten through the Discussion Topic to the right, summarize for your students the actual roles of each participant. From The Bully’s Perspective: The ringleader, or main bully in this case is the anonymous poster who attacks the girl in the comic first. It is very common to “misread” something someone says online because often conversations are quick, offered without much forethought and the written word is not accompanied by tone, inflection, or facial gestures. For this reason, online communication often leads to a misunderstanding, which is a typical source of conflict. From the Followers' Perspective: The disinhibition effect takes place when the anonymous posters cannot see or read social cues while "communicating" with the target; therefore she says horrible things (i.e. "pile on") without feeling much empathy for the target. 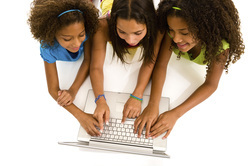 upstanders or allies in future cyberbullying situations. Ally: A person who takes a stand to defend the target. Bystander: A person who is present at an event without participating in it. Empathy: The capability to share another being’s emotions and feelings. Disinhibition: Unrestrained behavior resulting from a lessening or loss of inhibitions or a disregard of cultural constraints. Exclusion: Intentionally rejecting someone from an online group, such as on a “buddy list,” Facebook group, or game. Flaming: Online “fights” using electronic messages with angry and/or vulgar language. Followers: People who don’t start the bullying, but join in and have the potential to escalate it. Name-Calling: Verbal abuse, especially as a crude form of argument. Newbie: One that is new to something, especially a novice at using computer technology or the Internet. Sniper: One who attacks other people from a concealed place, defined by the authors of Dealing With People You Can’t Stand. Target: The victim of the bullying or cyberbullying. First, download and distribute the comic under "Materials Needed." This true story came from a high school girl cyberbullied by a Digital Pile On. The comic introduces a personal story for the students that starts off this lesson. Define what a Digital Pile On is to your students. Ask them if they’ve ever been ganged up on in a Digital Pile On or if they've participated in ganging up on someone else? Have they ever said anything online that someone misinterpreted or took the wrong way? Ask your students to identify who is the target, who is the bully and who are the followers. See "Roles" to the left. Teacher/author David A. Levine developed an empathy-building exercise below called the Event Empathy Action (EEA). The EEA is a three-step advanced listening approach that teaches students how to respond to others with empathy. The following activity works best in a low-tech classroom. After the students have read the comic, ask them to pretend that the incident has just recently happened to a close friend of theirs--and that they were watching it all unfold on Facebook. What happened? (Identify the event). When the class has completed this simple exercise, ask students to pair up in threes as a group. In each three-person group, allow each person to read one answer to the above questions and discuss briefly as a group. On the blackboard write down the various groups' answers. The following are several tips from the Digital Pile On chapter of Cyberslammed. If there is time in this lesson, discuss Netiquette with your class and ask students to volunteer their own strategies for avoiding online conflict. There are many additional pieces to this chapter, including more conflict resolution exercises, how to identify a Digital Pile On at its lowest-to-highest spectrum (and when to bring in the administration, police or even an attorney) and how to help students transform a traumatic Digital Pile On with resiliency. Netiquette: Know the rules of Internet etiquette, i.e. how to behave in an online environment. A list of Netiquette rules can be found here and printed out. Communicate Clearly: Avoid sarcasm, mockery, and sharp joking online with people you don’t know well. Make sure you are careful to say what you really mean. Without being able to see and hear tone, gesture, and eye contact, words communicated online often become misinterpreted, resulting in miscommunication. Keep Your Defense Offline: In a Digital Pile On, you are immediately outnumbered, so get offline. The common tendency is to want to “put out a statement” or argue your case in the same online setting in which you were attacked, but experts who’ve seen this happen to others say this is exactly what trolls want. They want to provoke you into getting angry and upset for their own entertainment. If you react online, you are only setting yourself up for further ridicule. The best thing a target can do in this scenario is to clearly state he or she isn’t trying to start conflict but won’t tolerate any more abusive behavior either—then get offline. Do not keep going back to see what they say about you! If you must discuss the conflict with the bully, first get adult support to help you strategize the outcome, and do it face-to-face, not online. Did this exercise work well in your classroom? If so, please feel free to share on your social networks! Netiquette: (Net etiquette) Rules for communicating with others on the Internet. Trolls/Trolling: Intentionally rejecting someone from an online group, such as on a “buddy list,” Facebook group, or game. Rule 1: Remember the Human. Ask your class to break up into small groups and make a list of their own suggestions to prevent being the target of a Digital Pile On. www.cyberslammed.com and for daily tips visit our Facebook page.